I am a self taught artist who has been painting and interested in art all my life. My favorite medium is acrylic due to its versatility. One of my favorite things to do is teach painting to other people. I currently teach classes and we couldn’t have more fun if we tried. It’s just so gratifying to see the excitement on student’s faces when they see what they can accomplish with a little instruction and effort. When your ready to forget the theory and produce the art, visit http://www.IamPainting.org. 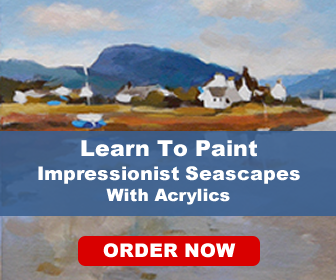 Learn Painting Techniques and create your own remarkable portraits or landscapes. Use whichever brush you feel comfortable with. I usually use a flat bristle brush for most of my work. And remember there is no right or wrong way to paint! 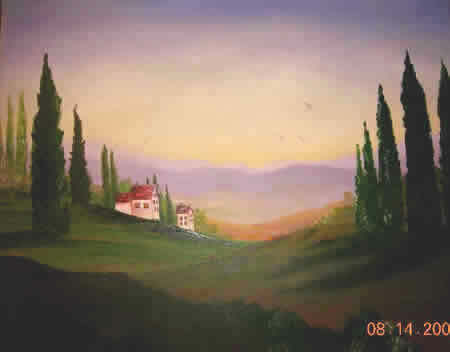 If your painting doesn’t turn out like mine – then congratulations! You created a unique one of a kind painting. 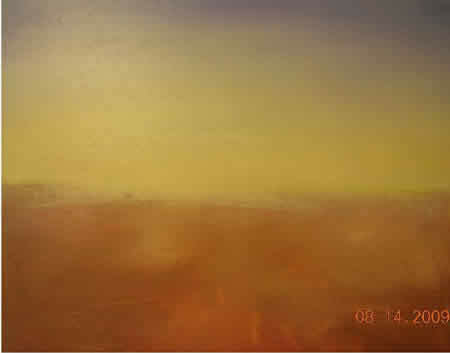 Sky – First wet the sky area or top half of canvas with white gesso. Then with a little yellow and a touch of orange added to the same brush, start at bottom of the sky area and work your way up. Use long horizontal strokes. 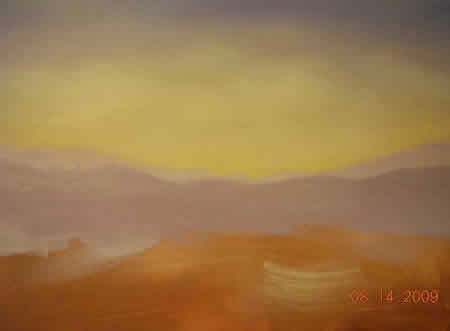 Take the strokes right off the canvas while blending the yellows and orange into the white gesso as you work upward. Gently blend right up towards the top of canvas. Wipe the brush off with a paper towel. Now add a touch of ultramarine blue and purple to the brush and start at the top of the canvas and work your way downward in the same fashion as you did the yellows. The bottom part of the painting is under painted with any earth tone colors. Nothing fancy here! 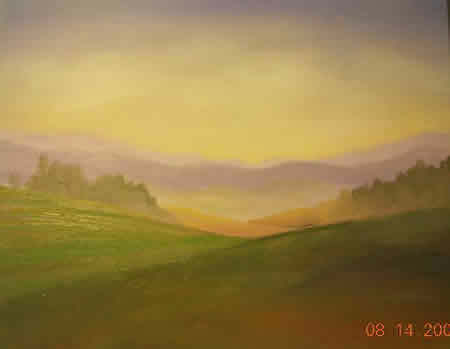 Use sky colors (a mixture of white blue and purple) and paint in furthest hills – mountains. Notice how these hills show very little detail and are very soft looking. Darken the mountain (sky) color and paint in next layer of hills. You want to make sure that you let some of the previous mountains show. Keep the tops interesting with some variations. 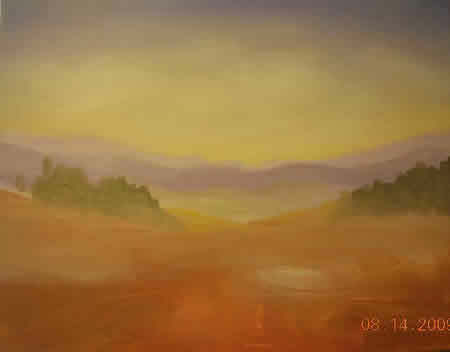 Add some earth tone to the very distant hills. You can use browns, tan, etc. Keep it dull though. Just add white to dull paint color. These are in the center of painting. Add some hunter green and start dabbing or scrubbing in the bushes. This should be a dull green. 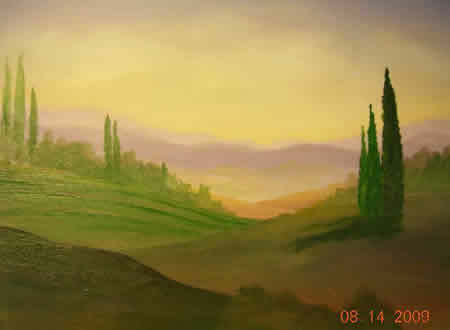 Landscapes typically get darker and more vivid as you work forward. Lay in the foreground hills. (you will do the one the left first) Make this one lighter to look like sunlight is hitting it. Now darken the mixture and add the hill on the right. Darken it with browns or tans. Too much green will make your picture look unnatural. 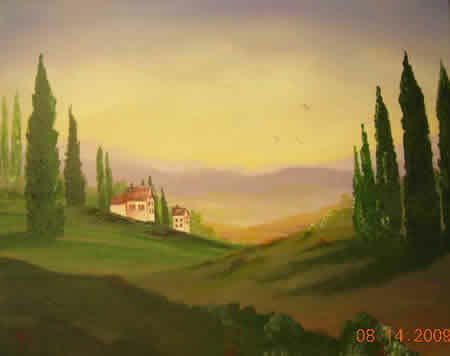 This hill will be painted the same way but starting on the right side of the painting pulling the paint into the painting and overlapping the previous hill. Continue painting until the entire canvas is covered. Don’t over blend! Let variations of color show. Now start adding the tall trees. If you are using a flat bristle brush, hold it on the side and dab on the paint in the shape of the tree. In the background they will be duller – or lighter. The ones in the foreground are hunter green. Add purple to the paint to darken the side that will be in shadow. Add some tree shadows to the ground. You could easily be finished with your painting now, and let the dramatic tall tree shadows be the focus. Or…Add some houses. Just draw in simple house shapes paint in the shapes with “dirty white “ and red for roofs. For shadows on the house, darken the roof color under the eaves. Dry brush in some white for highlights on the roof. Add a touch of orange for lights in the houses. Add birds – Birds are just little v’s – Practice first and keep then dainty! and sign your painting…. 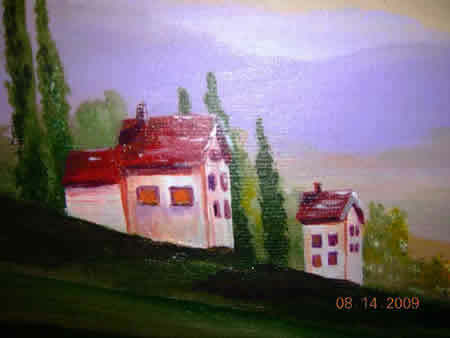 I’m a real beginner and have also had a long break after my initial painting class due to family illness and death. I found this lesson very helpful – not too complicated or intimidating. I really think I might be able to do it this way and feel encouraged to pick up the brushes again. Thanks. I am very happy to read that you found this lesson helpful. A big thanks to Julie Shoemaker for sharing her lesson with us. Hi there 🙂 I think your lesson is awesome! I use to paint lots a long time ago, and have since decided to take it back up 🙂 It was a little daunting at first, as I wasn’t sure where to begin! But you’re little tut helped me find my wings again and realize that painting is all about the experience and fun! So thank you! THIS PAINTING IS BEAUTIFUL. I HAVE NEVER PAINTED BEFORE, BUT I THINK I’M GOING TO TRY. ALL I’VE DONE IS DRAW AND I HAVEN’T DONE THAT FOR A LONG TIME, BUT IVE PICKED IT BACK UP. MY SON BOUGHT ME AN ACRYLIC PAINT SET AND CANVASES, SO HERE I GO. THANKS FOR BEING ON LINE. It is really intelligent painting system. Your step by step instruction has really helped me and I look forward to teaching my niece. Thanks! Can’t wait to try this! Love to paint foggy, misty scenes–not so easy in acrylic. Thanks. I just finished a practice run at a Tuscan scene, before doing a big one 4 times larger for our front foyer arched inset. After looking at my test run, I was not happy with the bright blue sky I had, and wanted something different. I found your page and love the approach. Your explanations are so clear and simple, you take the stress out ,and I’ve been stressing doing the painting for our foyer.